The world will give you plenty of reasons why you can't achieve your goals. Learn to control your thoughts and your environment, and there's no challenge you can't push through. Feel like the whole world is conspiring to get between you and your goals? Do you find "Dust in the Wind" running through your head where "We Are the Champions" used to reign? Like a turtle trying to crawl up a flight of stairs, you, my friend, are stuck behind a mental block. Ask around, and everyone will offer a special recipe for being as awesome as they are. But here's what they probably won't tell you: Being happy and successful for the long run requires more than just a desire and a plan. Success requires you to forge the kind of mental strength and self-control that starts in the gym and then permeates all areas of your life. This isn't easy. It takes diligence in the gym, humility when you leave it, and a willingness to toss aside cheap thrills and petty victories. On the other hand, once you get the hang of it, you'll have the tools to crush your goals now, and in the years to come. Your goals drive you. 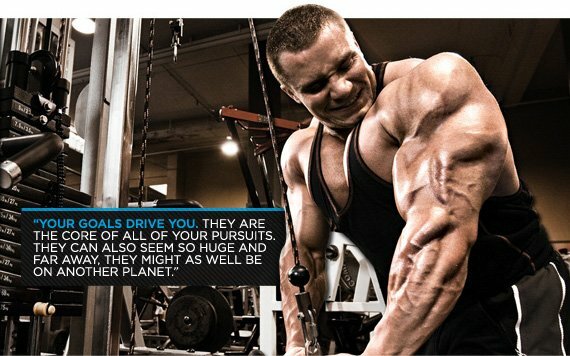 They are the core of all of your pursuits. They can also seem so huge and far away, they might as well be on another planet. You can bring them closer by realizing that every big end-goal is a bundle of hundreds—maybe thousands—of small goals you can attack and conquer, one after another, like levels in a video game. Remind yourself why you set those goals in the first place, and why they hold so much meaning and value for you. Then think about what will matter after you achieve that goal. More than the goal itself, it'll be the strength and ability you develop along the way. So break your goal down, and commit yourself to the idea of progress: always moving, improving, and developing. 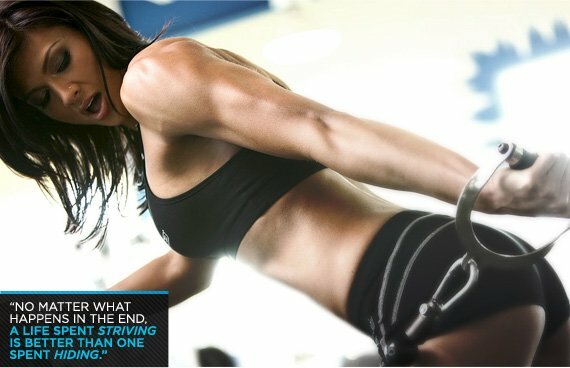 Just like your workouts, right? Not to spoil the ending for you, but it turns out that all that stuff you've heard about how "the journey is the destination" is true. There's no doubting the satisfaction of proving a naysayer wrong. Regardless of whom you are or what you achieve, you can probably point to someone who didn't believe in you. It might have been a straight-up hater who openly mocked you; it might have been a polite friend or family member who was nonetheless equally dubious about your prospects. You can try to shut these people out, or use them to fuel your fire. Maybe they do it out of jealousy, or to make themselves feel better about their own mediocrity—it really doesn't matter, so don't get bogged down psychoanalyzing them. They don't get it. You do—and you're better off being like you than like them. Think of it this way: Which world would you rather live in, one where "you can't do that," or one where you can? You've known the answer since you were a kid. And the difference between the two worlds is as simple as making the choice to throw yourself into the adventure. 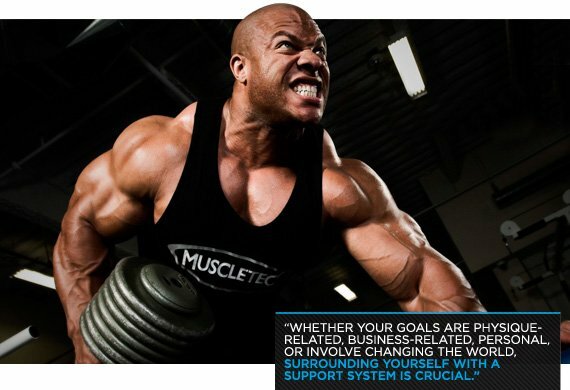 Whether your goals are physique-related, business-related, personal, or involve changing the world, surrounding yourself with a support system is crucial. You may have the goals, but you don't have the experience—yet. So use the knowledge of those who tread your path before. Even with all the social networks in our lives today, finding support and trustworthy knowledge can be a difficult task. But trust me, your community is out there. It might include authors who died centuries ago, friends you've known all your life, or strangers on the other side of the world. Your crew can be made up of people with similar goals and desires, or just people who see the world in the same basic way as you. Inspiration is tricky business, so stay open-minded. You never know where wisdom can come from. If you're living in a world that seems deaf to your dreams, then try listening harder. Just as being surrounded by likeminded people is a key to moving forward, negative influences will drag you back to square one—if you let them. Once you put progressing toward your goals at the center of your life, it'll become clear what (and who) fits with that progress—or doesn't. Few things can be as damaging to your progress as temptation and distraction, whether in the form of a person, a vice, or a personal weakness. Remember, the path you've chosen to walk goes through the world, but the world doesn't share it. It's yours. Don't let someone trip you along the way. You don't need to become a monk or a nun to achieve your goals. But at the same time, it's true that clean living and self-control are wildly underrated. They can help you more than you think, and they get a little easier every day. There's no use denying it: That little voice is in there. It tells you to hesitate. It questions your ability, phrases everything in terms of "probably" or "possibly." It fears uncertainty and tells you to do the same. This is normal. Without that voice, you probably would have accidentally blown yourself up or driven off a cliff years ago. But if your goals don't include achievement and happiness—if your voice just tells you to stay alive—then you need to learn to duke it out with that voice. Use conviction and speak to yourself in positive absolutes. If you have to literally talk to yourself in order to defeat the hater within, then do it. Life is uncertain, and it's easy for anxiety and fear to spiral out of control. The strength to withstand them isn't constructed overnight; it has to be built and reinforced at all opportunities. Despite the name, nervous energy isn't some overwhelming wave of anxiety. It's a subtle force that controls you in ways you don't even realize. You know you should be working toward your goals, but instead, you flip from channel to channel, wander from website to website, chew your fingers, and avoid anything productive. This is just that little fearful voice taking another form. It says, "Your goals are so big and so far away. Why even bother? You're already great at doing nothing!" This is one of the most difficult items on this list, and many people you know will never be able to master it. But you've made the choice to be different. You know that no matter what happens in the end, a life spent striving is better than one spent hiding. Whoa—slow down. Rather than sitting around fretting and inventing scenarios, find ways to occupy and stimulate your mind. Read books, watch movies, hang out with friends, or find projects to help you escape the loop. If your goal involves an event, then practice taking your mind to a relaxing place. Visualize yourself wherever you find to be the most calming—it may take some time to figure out where that is. Try to hear the sounds, smell the surroundings, and feel the sensations of being there. After practicing for a while, you'll find you can access this place and find a little peace and clarity whenever and wherever you need—even in the heat of competition. I am a firm believer in facing fears in order to conquer them. Let yourself go "there," wherever that is. Consciously expose yourself to the source of your fear, in small controlled doses initially, and then with greater intensity. Desensitize yourself, and you can overcome the fear; don't do it, and you'll find yourself trying not to think about certain things, which gets you no closer to where you want to be. 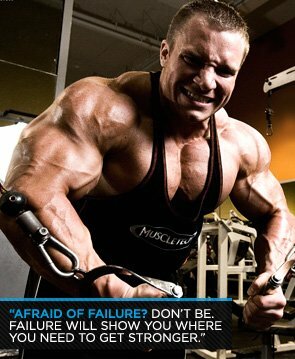 Afraid of failure? Don't be. Failure will show you where you need to get stronger. Once you get comfortable with it, it can be your best friend and guide. It's a crucial part of the story of your success, and without it, you won't learn the lessons you need to succeed.